The Portable Road Side Mirror allows for extra visibility around construction equipment especially on blind corners where traffic is flowing next to heavy machinery. This lightweight and robust portable mirror is suitable for outdoor use and is an economical way to ensure safety in dangerous road side situations. 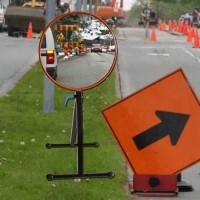 The 24" Portable Road Side Mirror allows for extra visibility around construction equipment especial..